Pilates is all about increasing flexibility, improving movement and gaining greater stability. These benefits are equally relevant for men as for women. Pilates was developed by this man, Joseph Pilates. He was driven to improve his own fitness partly because of health problems as a child. Over his lifetime he made dramatic improvements to his body with his exercises. So why then are Pilates classes not filled with men? Is it because Pilates has a feminine image? Is there a perception that the exercises are too easy? Could there be an element of embarassment around exercises that work on flexibilty and coordination; that men can't match up to women? Well, Pilates exercises aren't easy! Exercises can be challenging in many different ways. For individuals with a lot of muscle bulk, it can be hard to find and recruit the right muscles. It can be hard to isolate muscle activation rather than just an 'on and off' with all surrounding muscle joining in. But, the benefits of getting it right are enormous. The correct stabilising muscles are used each time instead of a damaging pattern of compensation by other muscles which aren't designed for the job. Pilates also improves your posture, which can free you from existing aches and pains, whether that's backache or headaches. It can help undo the damage done by long, desk-bound hours of sitting at work. The various releases and stretches we use help to combat tension and tightness in, for example, neck, shoulders, pecs, back, glutes and hamstrings. 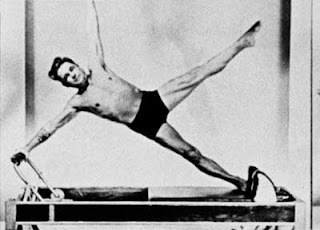 If you have a sport, Pilates is a fantastic way to cross-train. I can't think of a sport where greater movement and shoulder, core and pelvic stability aren't going to help you to perform better. It's also a great way to deal with stress, leaving you feeling freer in mind and body. And, the chances are no one is really looking at anyone else in a class as everyone is busy focussing on what they're doing!